COLUMBUS, Ohio - The Ohio State Buckeyes were treated to one of their own Wednesday at the Woody Hayes Athletic Center during their Real Life Wednesday program for this week: Corey Linsley, the starting center this past season for the Green Bay Packers as a rookie after a solid career as a Buckeye from 2010-14, spoke to the team about his transition from Ohio State into the NFL. Linsley, one of seven rookies from Ohio State to start games in the NFL this past season, spoke to the team about the agent selection process, about how teams evaluate college players, what NFL training camp, preseason and the season is like, and choosing a financial advisor, along with providing insights about his rookie season and life in the NFL. During the evaluation stage, Linsley said that having confidence is huge. He told the players not to worry about not getting a combine invite or a post-season all-star game invite because plenty of players get drafted who haven't been to either. 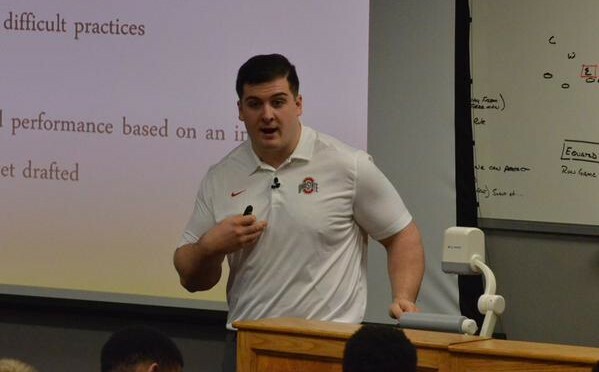 He said to be confident when you are working out because "Ohio State will prepare you for the NFL." Linsley recommended speaking with multiple individuals when it is time to choose an agent and he advised bringing another person along to the interviews - such as a Mom or a girlfriend - to provide an additional resource for good questions. He also said that agent's will have little influence on one's draft prospects. Linsley said the money goes quickly. He said he was fortunate to live in an area like Green Bay - vs. New York City, for example - so his rent wasn't overwhelming. But he also said tickets to NFL games are expensive and the price adds up quickly. "I spent more money on tickets than I did on rent," Linsley said. "Everyone in the family doesn't need to come to a game." Be cool in the interview process. Linsley said during interviews teams will ask all sorts of crazy questions just to see how you react. "They want to know if you are going to get ticked off over things or if you are going to handle the pressure," he said. Linsley was the only Green Bay Packer to play in every snap in 2014, so he also stressed to the team the importance of taking care of the body. He has been training during this off-season at the Woody Hayes Athletic Center, but will be leaving within the next two weeks for Green Bay for Year No. 2 in the NFL.